Little research has been done to measure how the TMJ changes due to treatment, or to quantify the pain some patients experience after treatment. Dr. Ikeda, working with Dr. Arthur J. Miller, Professor of the Orofacial Sciences and Physiology Depart-ment at the University of California, San Francisco, decided to explore the issue. “I wanted to do joint congruence analysis to see changes in spatial relations between the fossa and condyle after TMJ surgery, and objectively quantify those changes,” says Dr. Ikeda. Then Dr. Ikeda learned about and started using Checkpoint™ from Stratovan Corporation. A set of state-of-the-art 3D shape analysis and visualization tools, Checkpoint gives healthcare professionals better landmark-based tools that facilitate a deeper understanding of 3D anatomic structures. 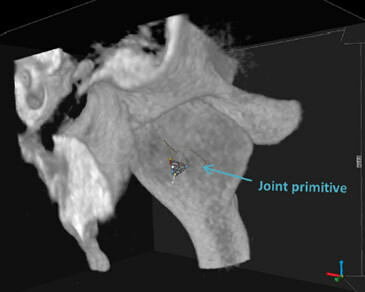 It provides 3D views of CT, MRI, PET and other 3D scans from a variety of modalities - including 3D surface scans - and enables the efficient collection of thousands of landmark points to provide precise analyses of complex 3D shapes. Checkpoint provides full 3D reconstruction to easily slice through for orthogonal and oblique views. It can load both surface meshes and volumetric DICOM scans, and extract multiple surfaces from a DICOM volume. A custom tool in Checkpoint analyzes joint surfaces for congruence and/or changes due to treatment or disease. Checkpoint is an ideal solution for researchers and clinicians who want a comprehensive one-stop tool to efficiently do precise analyses of complex 3D shapes. It enables the collection of dense sets of data points on 3D spatial measurements to more easily analyze shapes using landmarks. There’s really no other software for 3D medical imaging like Checkpoint. 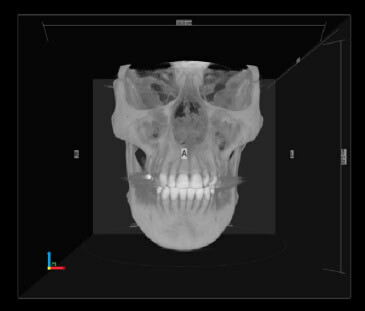 UCSF wanted to study the impact of orthodontics treatment on the temporomandibular joints (TMJ), but it couldn’t find an efficient, easy tool to view, manipulate and measure the joints in 3D based on DICOM data. Stratovan’s Checkpoint™ for medical imaging - a comprehensive set of state-of-the-art 3D shape analysis and visualization tools, provides better landmark-based measurement capabilities for a deeper understanding of 3D anatomic structures.